Pulse pecans in a food processor until finely ground. Add butter and process until smooth, about 1 minute. Add sugar and vanilla, and pulse to combine. Add flour and salt and pulse until a soft dough forms. Turn dough out onto foil or plastic wrap and shape into a log, about 1 1/2 inches wide. Wrap and refrigerate 30 minutes. Preheat oven to 325°F. Slice log into about 24 disks, then roll into balls. Bake for 15 minutes until slightly golden. Dump confectioner’s sugar into a pie plate. 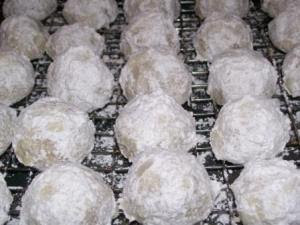 Briefly cool cookies on a rack, then roll in confectioner’s sugar. Return cookies to rack and cool completely. Roll in confectioner’s sugar again. 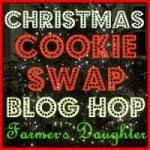 This post is part of the Christmas Cookie Recipe Swap Blog Hop, hosted by my alter-ego Farmer's Daughter. Please join in the fun!